The revolutionary new computer controlled local anesthesia injections system that conquers fear, pain and anxiety. Advances in technology are significantly enhancing patient comfort both during and after dental treatment. One of these technologies is the single tooth anesthesia (STA) system for giving dental injections. Many patients are not even aware that the injection has been given. Patients leave the office without the numbness in their cheek, tongue, or lip that often accompanied traditional syringe injections. 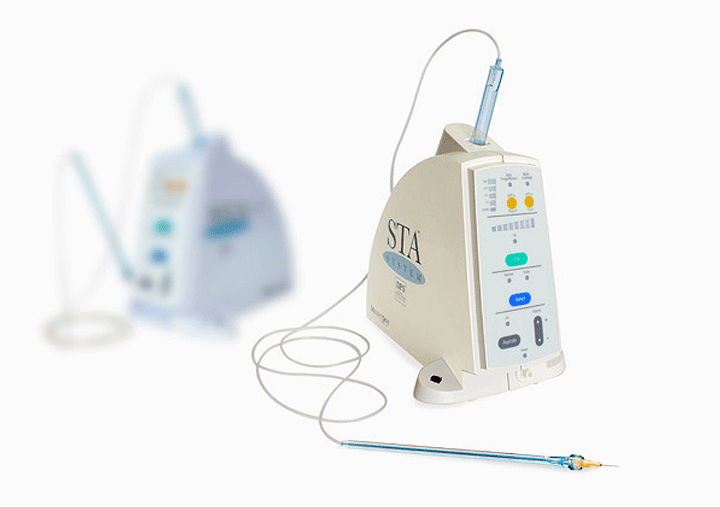 At Dr Joy Dental Clinic, we use this STA system and other technologies to enhance your comfort and eliminate the stress associated with going to the dentist. The WAND is a computer-controlled local anesthesia delivery system. Wand hand-piece is a computer-controlled dental injection system. The flow rate of the local anesthetic is controlled by a computer. This means that the injection is guaranteed to be slow and steady and therefore comfortable. It means less discomfort for you as most of the sting from a traditional dental injection comes from the anesthesia solution being delivered too quickly. The STA system base unit looks like a computer modem and the Wand hand-piece looks like a pen with a small needle at the tip. With the aid of state-of-the-art technology, the Wand delivers exactly the anesthetic you need at exactly the right rate make your visit as comfortable and anxiety-free as possible. Hence, a more pleasant dental experience. The WAND is an excellent example of our efforts to bring you the latest dental technology, and to help all of our patients have a pleasant, positive visit to our clinic. Feel free to ask us if you’d like to know more about this remarkable new system. It is really different and you have explained a lot how it works and shall it is applicable for all the age of the people, please say about it if there is any other effects.